The first day of our continuation of The Tour of England, 🏴󠁧󠁢󠁥󠁮󠁧󠁿 and we cross the open border into England’s largest county ….. Yorkshire, the land of Richard III (but not his bones), Geoffrey Boycott England’s greatest ever cricketer (if you believe him), Tetley Tea, Rugby League, and the ubiquitous Yorkshire Pudding! Also they have some cracking good abbeys and the plan today was to drive for 4.5 hours to visit two of England’s finest monasteries, Rievaulx of the Cistercians and Whitby of the rival Benedictines. Rievaulx is one of the great Cistercian abbeys of England, situated in North Yorkshire near Helmsley, and build around 1132. At its peak 640 monks lived here, all members of the Cistercian order. The keynote of Cistercian life was a return to literal observance of the Rule of St Benedict. 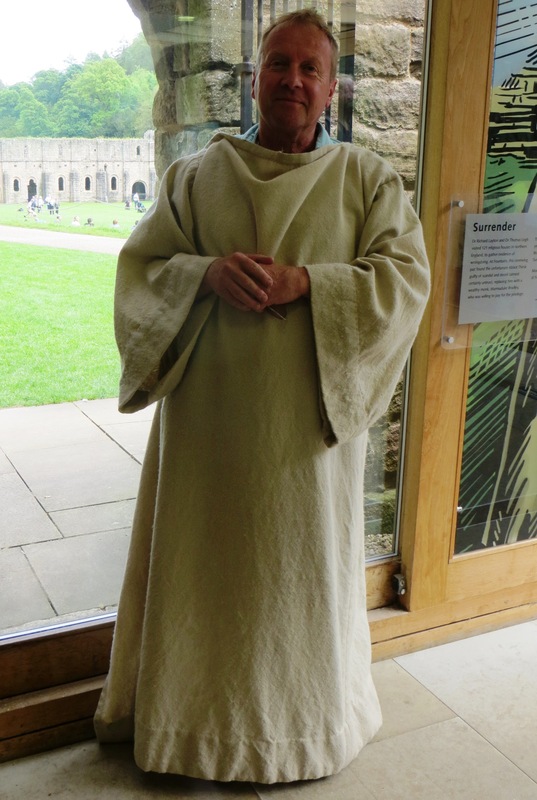 Rejecting the developments the Benedictines had undergone, the monks tried to replicate monastic life exactly as it had been in St Benedicts time; in various points they went beyond it in austerity. The most striking feature in the reform was the return to manual labour, especially agricultural work in the fields, a special characteristic of Cistercian life. However Cistercian is considered one of the most beautiful styles of medieval architecture. Additionally, in relation to fields such as agriculture, hydraulic engineering and metallurgy, the Cistercians became the main force of technological diffusion in medieval Europe. In 1538, the dissolution of the monasteries by Henry VIII resulted in the stripping of all monetary value from the place and its complete destruction. Whitby Abbey is situated high on the cliffs above Whitby in North Yorkshire and overlooking the North Sea. It was founded in the 7th Century by the Anglo Saxon king, Oswa. It was home to the great Northumbrian poet Cædmon and there is a college named after him in the town below. During the medieval period it housed Benedictine monks until the dissolution of the monasteries in 1538 by Henry VIII. Bizarrely it was shelled by a German battleship during WWI, but is perhaps best known for its inspiration for Bram Stokers Dracula. The same as Rievaulx, it is owned and managed by English Heritage. Enjoy the photos, monochrome seemed a more suitable medium today given the dourness of Yorkshiremen generally, the sad history of these two abbeys, and the weather with grey skies. Tomorrow, onwards out of Yorkshire and into Durham. We’ll be back! Posted on September 18, 2018 March 4, 2019 by Dr BPosted in English HistoryTagged Benedictine, Cistercian, England, English Heritage, Rievaulx Abbey, Visit England, Whitby Abbey, Yorkshire. I visited Whitby Abbey 41 years ago when I flew to England to marry my Yorkshireman. It had just snowed and the abbey looked stunning covered in snow. I just loved it. Your pictures are perfect in monochrome. Fountains has always been my favourite. 😂😂🙏 May call in at Fountains on way back on Saturday, three in a day would have been too much! And you can get to dress up!